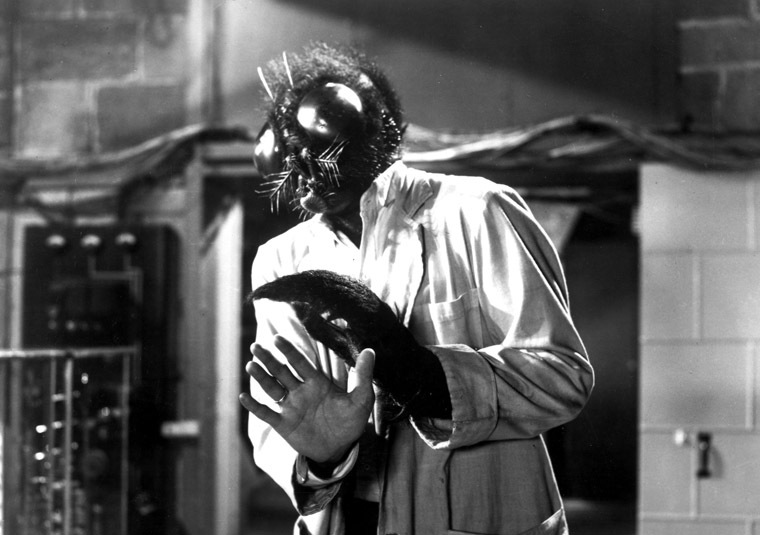 While there are plenty of novels and films told from the viewpoint of an animal, the notion of an insect's perspective been an element in horror novels and films far more often than in literary fiction. For, it seems, there is something intrinsically horrible about being an insect; one thinks at once of the unfortunate Gregor Samsa in Kafka's Metamorphosis, or of the face of Vincent Price on the body of a fly trapped in a spider's web, plaintively calling "Help me! Help me!" (while, back at the lab, as shown here, his body now sports the fly's head and arm). But perhaps a fly's eye point of view is not necessarily so grim -- after all, we've all probably used the phrase 'fly on the wall' to describe that view of human business which observes, without participating, things hidden to others. Making this metaphor literal is certainly a curious choice, but not unheard of -- Emily Dickinson managed it in "Bee! I'm expecting you! ", and Patrick McGrath, perhaps best known for his novel Spider (made into a film by David Cronenberg who, coincidentally, also did a remake of The Fly) employed a fly as narrator in his 1988 short story "The E(rot)ic Potato," (collected in Blood and Water). "I beat the wings I didn't know I had, and rose. I could fly! Was I dreaming? The black air was surprisingly viscous. My wings outstretched, I let myself descend, circling slowly through the thick stuff, passing through roiling, wispy clouds that felt cool on my skin. I was definitely awake. Could I be an angel? Euphoria and disbelief gathered in me. I reveled at having been chosen, against all odds to be part of the heavenly host." Jacob soon discovers that he is, on the whole, rather small for an angel, but also finds that his tiny size and ability to go unnoticed give him a singular perspective on the humans he discovers in twenty-first century Long Island. Indeed, to be noticed is his only peril -- since for humans, there is only one reason to notice a fly, which is to swat it, then mutter an exclamation of satisfaction at its demise. Still, Jacob's hovering grace casts at least a bit of magic on the daily doings of his human 'hosts' -- we are often reminded of just how peculiar our contemporary lives might seem to a visitor from a distant time, and so of how peculiar they in fact are. We may not believe in reincarnation -- or, if we do, we might regard the life of a fly as punishment for some past misdeed -- but here, oddly enough, it seems to be a strange kind of reward, as is the experience of reading Jacob's Folly. Miller's novel came out a few months ago here in the U.S. -- and I was delighted to discover that its UK publisher is the same as my own, Canongate. Readers there -- at least those who resisted ordering a copy from abroad -- are in for a treat, as it's just been published there today.